At least once a year I make the nearly 10 hour trip to my hometown, Corpus Christi, Texas. Over the years I've struggled with luggage, carry-ons, and increased security measures but I've finally got packing my carry-on down to an art form. I've compiled a list of a few of the items I don't travel without. Sleep Mask: I don't know about you, but when my flights are more than 3 hours I get bored and try to sleep. Invariably the person next to me is a reader with the overhead light on for the duration of flight, or someone insistent on leaving the window shade up. A sleep mask let's them read or enjoy the view without disturbing your beauty sleep. I love this one that channels the classic film, Breakfast at Tiffany's. Cute Socks: I love to kick off my shoes but I hate the idea of bare feet on a plane! A cute pair of socks will keep your feet warm and you won't feel like a weirdo walking to the lavatory bare foot (or maybe that's just me). A Watch: My iPhone battery is depleted pretty quickly when I'm bored and travelling. I like wearing a watch so I don't have to keep turning my phone off and on to check the time or rifle through my huge handbag to find it. I won this one from a giveaway and I really like it (more about that later!). A Huge Wrap or Scarf: I know, I know, I'm always raving about my American Apparel circle scarf but seriously, it was made to travel. It's almost 50 inches long, and you can wrap it around your neck like a normal scarf or open it up and wrap yourself in it like a blanket without the extra bulk in your bag. 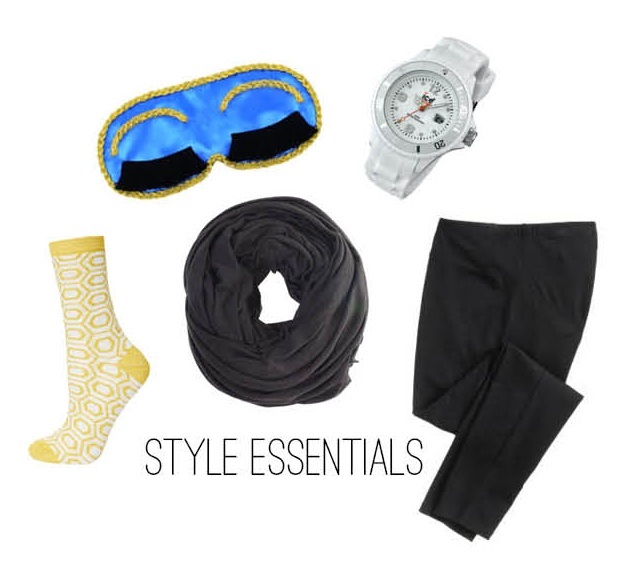 Leggings: Comfortable clothing is a must when you travel. I was thinking I would wear my silk pants, but sitting for 8 hours is going to make for some wrinkly pants. Leggings are comfortable, versatile, and easy without being sloppy. iPad: I don't go anywhere without my iPad. I can read, play games, listen to music, watch a show, or work on stuff for the blog with ease. I pack my bulky laptop in my checked baggage and opt for my iPad every time. Magazines: Whether you prefer paper copies or reading them on a tablet, magazines are fun to browse when you're bored. I like to read Vogue's in-depth articles, Glamour's style section, and I'm always clipping Real Simple's recipes. Power Mate Plus: In the event your iPhone goes dead give it a boost with this little device. Super portable and with the power to almost completely charge your iPhone you'll carry it around with you on a daily basis. P.S. It charges the iPad as well! Earplugs: Crying babies and obnoxious seat mates are no match for a good pair of earplugs. They're cheap and disposable and available at drugstores and sometimes in the terminals. Get some. Headphones: Headphones should be a common courtesy when travelling in such a tight space. Unfortunately, not everyone is in on this fact so I like to put in my headphones and listen to some of my favorite albums. Right now I'm really into Florence & The Machine. Hand Sanitizer: For when you can't get to a sink, or the lavatory is occupied it's always helpful to have some hand sanitizer. I like this one from Burt's Bees but traditional Purell is always a favorite. Eye Drops: My eyes get so dry when I travel and sometimes that causes some redness. Rhoto eye drops are the best of the best at getting the red out. These drops aren't like traditional eye drops either, they deliver a mild cooling sensation leaving you feeling refreshed. Lotion: Dry skin is no match for this L'occitane hydrating lotion. Going from drizzly Boston, to the cabin, and then to the dry Texas heat really does a number on my skin. Plus, the formula is gentle enough for sensitive skin like mine. 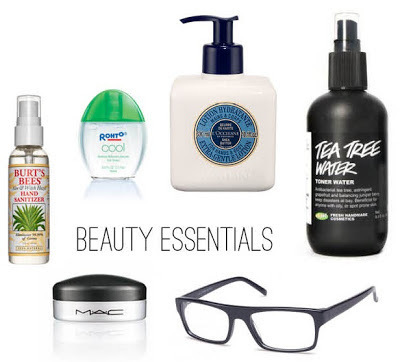 Face Mist: I use Lush's Tea Tree Water as my daily toner but it's also great to travel with. I give my face a spritz when I feel like my skin feels dry or dirty. Evian's facial mist is also popular among frequent travelers, but I find this double-duty product to be just as effective, if not more. Lip Conditioner: A great lip balm like MAC's lip conditioner keeps my lips feeling soft while providing a little shine and color. It's available tinted or in an original formula and comes in either a tube or a tub. I have a tub of their pink and it never leaves my purse. Glasses: I like to sleep on the plane and I wear contact lenses so wearing glasses when I travel is a must. I don't wake up with my contact lenses stuck to my eyes, and my favorite cat eye pair add flair to any outfit. Apple Chips: You can purchase these dried apple chips at the grocery store or you can make them yourself. They're easy to carry, come in different flavors and are an all around healthy snack. Apple Sauce Packs: Many of these are right around 3 ounces; just enough to get through that security gate. I like Fruit Me Up in Mango, Pineapple, and Apple (although those come in 4 ounce packs, so opt for GoGo Squeeze or Mott's packages. Best of all, no spoon necessary. Fresh Fruit: I eat a lot of fruit when I travel (obviously) and fresh fruit is delicious and hydrating. Cantaloupe, peaches, strawberries, watermelon, citrus fruits, kiwis, pineapple, and cherries are all hydrating and packed with vitamins. Vapur Anti-Bottle: I refuse to pay upwards of $3 for a bottle of water at the airport. I bought a Vapur Anti-Bottle at the MOMA store in New York City and it's great. It's almost like a really durable plastic bag for drinks. I fill mine once I get through security and again before boarding. Drinking tons of water is a must, you'll look better and feel better when you step of the plane. What are your travel must haves? I'm making my list and checking it twice in preparation for my flight Sunday morning and I don't want to forget anything!